What you are about to read is 100% true to the best of my knowledge, and it all started in September of 2012 when we were in the process of launching the Natural News Store and receiving organic certification from the USDA. I knew we wanted to offer chlorella under our own brand name, but I had heard rumors of chlorella from some sources being contaminated with heavy metals, pesticides and even pharmaceutical residues. I began asking around and quickly discovered that no one had done laboratory tests on a broad selection of chlorella to determine contamination levels of chlorella from different countries and sources. This surprised me, and I decided to take on the task myself. I proceeded to purchase chlorella from 17 different sources, some were chlorella supplements purchased at retail, and others were chlorella purchased directly from importers and suppliers. I took the chlorella from each source, placed it in a new Ziploc bag and affixed it with a label containing a letter and a number such as "N03" or "M01." I did this myself, changing my latex gloves between samples, to make sure it was done right. Then I had all these samples sent to a reputable laboratory specializing in the detection of metals in food products. This is good news. Our tests found no detectable mercury in any of the chlorella samples, even the chlorella from China. This result is actually a little surprising, given how strongly chlorella binds to mercury. You would think that chlorella grown outdoors, downwind from coal-fired power plants, would accumulate mercury, but our tests showed zero detectable mercury in ALL samples. Note that Arsenic, Cadmium and Lead are all under 1 ppm and therefore only "trace" levels. These do not concern me, as there is far more arsenic in apple juice, for example, and there's probably more cadmium and lead in many types of seafood than in chlorella from China. But the one number here that does concern me is the aluminum concentration. Given that aluminum intake is something most people seek to avoid, it seemed important to document the aluminum levels in various sources of chlorella. Granted, there is aluminum in lots of other foods and supplements, but chlorella is specifically taken by people looking to remove metals from their bodies, not introduce yet more metals into their digestive tract. So this number of 29 ppm alarmed me, and I decided after seeing these results that I would never sell chlorella grown in China because I didn't want my readers eating 29 ppm of aluminum. Here's the real shocker in this: According to our lab tests, the highest concentration of aluminum was found in a certified organic chlorella grown in China. That sample tested at 33 ppm Aluminum, the highest of all our tests. And remember, this chlorella is sold in the USA as USDA certified organic chlorella. By comparison, the non-organic chlorella produced in Korea showed zero detectable Aluminum. In essence, our lab tests revealed that when it comes to chlorella, certified organic doesn't necessarily mean cleaner chlorella. In fact, the cleanest chlorella we found wasn't certified organic at all. You might wonder: How can this be? Doesn't organic mean clean? No! Organic certification is the certification of a growing process, not an end result. You can follow organic practices, but if you're growing chlorella right next to a chemical plant, for example, you're going to get some cross-contamination in the soil, the air, or the water that's used to grow chlorella. Your chlorella can still be 100% certified organic even though it's far more contaminated with metals than non-organic chlorella. This is an important distinction because most people equale organic with "clean." But that's a huge mistake, because with chlorella, the country of origin seems to be far more important than whether it's organic or conventional. Organic certification does not require testing for heavy metals, by the way. A product can be heavily contaminated with aluminum, lead and even mercury and still be certified "organic" by the USDA. In terms of chlorella grown outdoors in large cultivation pools, Taiwan was by far the cleanest source. There are three chlorella producers in Taiwan, each with varying degrees of quality and purity in their final product. The cleanest producer of chlorella in Taiwan is a certified organic producer whose final product is so expensive that, to my knowledge, almost nobody sells it in North America. Except us. We are the first large retailer to carry this chlorella, which we call "Clean Chlorella SL" where "SL" stands for sunlight. This is the cleanest chlorella we could find that's grown in pools where it receives natural sunlight. This sunlight helps boost production of chlorophyll and CGF (Chlorella Growth Factor), a unique complex of peptides and phytonutrients that's unique to chlorella. This chlorella will be available from the Natural News Store around March 1 (it is currently in production). This Clean Chlorella SL tested at only 3.8 ppm of aluminum, nearly one-tenth the levels found in "certified organic" chlorella grown in China (and widely sold across the internet in the USA). Level of arsenic, cadmium, lead and mercury in Clean Chlorella SL were undetectable in our lab tests. In terms of a country of origin, Taiwan is arguably the best source for chlorella overall, and our lab tests showed that chlorella from all three sources in Taiwan is consistently cleaner than chlorella grown in China. The highest aluminum contamination we found in a Taiwan-produced chlorella was just 11 ppm (one-third that of the highest contamination found in China), and the lowest was 3.8 ppm. Concentrations of other metals found in Taiwan-grown chlorella were negligible. In summary, Taiwan was overall the cleanest producer of chlorella, most likely due to the relatively clean environment in rural Taiwan, where the chlorella is produced. If you know much about Japanese culture, you might think chlorella grown in Japan would be the cleanest, most precisely-controlled chlorella on the planet. But it turns out this is simply not the case. Our lab tests showed Japanese-grown chlorella to be more contaminated than chlorella grown in Taiwan, but less contaminated than chlorella grown in China. Across the samples we tested, chlorella grown in Japan averaged 16 ppm of aluminum, about twice that of Taiwan chlorella but half that of China chlorella. * The Korean chlorella is grown indoors, which I will explain later. Comparing Korean chlorella to the others is a bit like apples and oranges. This is a very interesting comparison because it shows that even the most contaminated chlorella we found has only a fraction of the aluminum found in everyday foods. However, before you conclude that this makes aluminum "safe," consider this: One source of aluminum pollution of food crops is chemtrails, where aluminum and other elements are sprayed into the atmosphere, apparently in some sort of mad science atmospheric experiment. So the 190 ppm of aluminum in celery is, in my view, suspiciously high and certainly not "normal." The same is true with all the other crops that are contaminated with aluminum from chemtrails, coal-fired power plants and other sources. Bottom line: Aluminum should be AVOIDED in your diet as much as possible. This metal has no beneficial role in human biology beyond trace amounts. In our research, we also learned that the market for chlorella originating in Japan has collapsed following the Fukushima nuclear disaster of 2011. There is great distrust among consumers that chlorella originating in Japan might be contaminated with radiation. We did not test chlorella for residual radiation, so we have nothing to report in this area. However, as someone who is scientifically trained, I very much doubt any significant level of radiation "resides" in chlorella from Japan. When it comes to chlorella, I'm more concerned about metals and synthetic chemicals than radiation. Moreover, chlorella has traditionally been used throughout world history as a method to help remove radioactive isotopes from the body. This is likely because in laboratory tests, chlorella binds very quickly and strongly to many different metals and elements, including those isotopes typically released in a radiation accident or nuclear attack (such as Iodine-131 or Cesium-137). According to an article written by Ethan Huff, "A 1989 study put forth by the Czechoslovak Academy of Sciences... found that chlorella greatly helped improve survival rates among mice irradiated with a lethal dose of radioactive gamma rays." One very interesting finding from our research was that chlorella marketing claims of being "pure" or "clean" or "natural" had no correlation whatsoever with the metals contamination concentrations found in our laboratory tests. What we did find is that even sellers of the most contaminated chlorella were happy to proclaim their chlorella was clean, pure, natural, etc., while implying it was the best chlorella on the planet. In some cases, companies selling the cleanest sources of chlorella actually downplayed their claims, sounding very humble and not pushing any hype at all. The conclusion from this? The marketing of chlorella is carried out with a lot of hype, and much of that hype simply isn't backed up by what we saw in our laboratory tests. One of the more disturbing findings that came out of our research was the discovery that some fairly well-known nutritional supplement brands in the USA are actually "cutting" their chlorella with cheap fillers in order to make it appear their customers are getting a better value. They will sell, for example, 500mg chlorella tablets, but the tablet turned out to be a combination of chlorella and cheap calcium filler! This means you're actually paying for (and swallowing) cheap "rock" fillers instead of getting 100% pure chlorella. Buyer beware! Some of the chlorella being sold out there is "cut" with fillers. This is easy to avoid by simply reading the ingredients list. Look for calcium carbonate. If it's there, your chlorella has been "cut" and cheapened. For the record, the Clean Chlorella we offer at the Natural News Store is 100% pure chlorella and not "cut" with anything. When it comes to chlorella, there is nothing grown commercially in North America. There are small operations in Hawaii, but not large enough to fill commercial demand. Cyanotech, the well-known producer of spirulina on the Big Island, does not produce chlorella, either. If you want chlorella, you have to go outside North America. The countries producing chlorella in large commercial quantities are Taiwan, Japan, China and, to a lesser extent, India, Indonesia and Europe. For many years, Japan was the leader in chlorella production, but Taiwan and China have since surpassed Japan. Chlorella is often packaged in the USA, but it is not grown in the USA. Here's another shocker when it comes to chlorella: Chlorella packed in capsules (i.e. veggie caps or gelatin caps) can cost you 380% more, gram per gram, than chlorella in tablet form. For example, one popular brand of chlorella sold at the discounted price of $10.98 on Amazon still costs 31 cents per gram of chlorella. 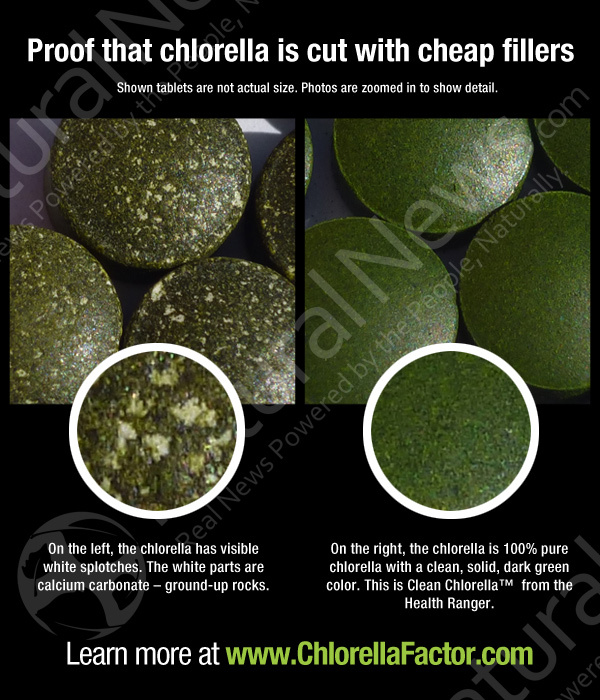 In contrast, the Clean Chlorella™ sold in the Natural News Store, which by the way is the cleanest chlorella in the world according to laboratory tests, costs just 8.2 cents per gram, or almost one-fourth the cost of the brand-name encapsulated chlorella sold on Amazon.com. You know the old adage that, "You get what you pay for?" That's not always true with chlorella. We found many examples where higher-priced, certified "organic" chlorella products were far MORE contaminated than lower-priced chlorella products. When it comes to chlorella, price is not a reliable indicator of quality. In fact, we found no correlation whatsoever between price and quality at the retail level. At the wholesale level, on the other hand, there was a strong correlation between price and quality. The cheaper the chlorella, the higher the levels of contamination with metals. But this cheap price at the wholesale level did NOT reliably translate into the retail prices being charged to consumers. Why is that? Because consumers are unable to tell the difference between cheap, contaminated chlorella and high-priced, "clean" chlorella. Many retailers take advantage of that and buy the cheapest stuff they can find (usually from China), then mark it up as much as 700% and sell it as "premium" chlorella. I'm not saying they all do this, but like in any industry, there's a wide spectrum of ethics among the key players: Some are more focused on providing value to their customers; other are more focused on maximizing profits for themselves. The chlorella industry has, over the last decade or so, done quite a number on the health-conscious public by convincing them that chlorella has to be "broken cell wall" in order to be absorbed during digestion. This is not accurate, however. The far more important issue is the digestibility of the chlorella. There is no standard for measuring "broken cells" of chlorella, and there is no standard process for breaking the cell walls. Some companies achieve it with a physical "milling" process, and others achieve it through vibratory methods. The chlorella produced in Korea, on the other hand, has such thin cell walls (because it is grown indoors, without sunlight), that it actually achieves higher digestibility than many "broken cell wall" varieties of chlorella. 1) What is the digestibility of the chlorella? Conducting lab tests to answer these questions is a daunting task, requiring hundreds of thousands of dollars in expenditures. As a result, we have not yet been able to fund these tests. Are aluminum levels in lower-quality chlorella really a health concern? By publishing the laboratory tests showing aluminum levels in low-grade chlorella, we do not in any way intend to imply that this level of aluminum is harmful to human health. Because chlorella is so incredibly powerful at binding with metals such as aluminum, it is believed that this aluminum passes right through the body, still bound to the chlorella (which can also bind itself to many other metals). Furthermore, even the most polluted source of chlorella shown in our testing -- a "certified organic" chlorella grown in China -- only tested at 33 ppm of aluminum. By contrast, a well-known wheat grass juicing detox / healing center in Florida actively doses its clients with a liquid containing over 1200 ppm of aluminum -- all while calling it a "detox." (Crazy but true.) For the record, mercury is also a powerful "detox" by the same logic, as it binds easily with other metals. That doesn't mean we should all run around drinking mercury. In truth, you are far more likely to consume metals like mercury, cadmium and lead in a seafood dinner than you are to get it from chlorella. This FDA chart, for example, shows the mercury contamination levels of commercial fish and shellfish. All these levels are higher than what we found in chlorella, across the board. By and large, all the chlorella we tested seems well within the margins of dietary intake safety on all the metals we tested. But there is an issue that concerns me which we have not yet tested: Pesticide and pharmaceutical runoff chemicals. It is reasonable to suspect that chlorella with the highest levels of aluminum may also correlate strongly with the highest levels of pesticides and pharmaceutical chemicals. Although these may only be present in trace quantities, they can still add to the synthetic chemical burden of the human body and liver. More tests need to be conducted on the various sources of chlorella to determine levels of pesticides, pharmaceuticals and other synthetic chemicals they may contain. Until those tests are conducted and published, the best precaution you can take is to get your chlorella from verified clean sources. • All commercially-grown chlorella is virtually free of mercury, according to our lab tests. There may be extremely trace levels such as parts per billion, but this is well below our detection limit. 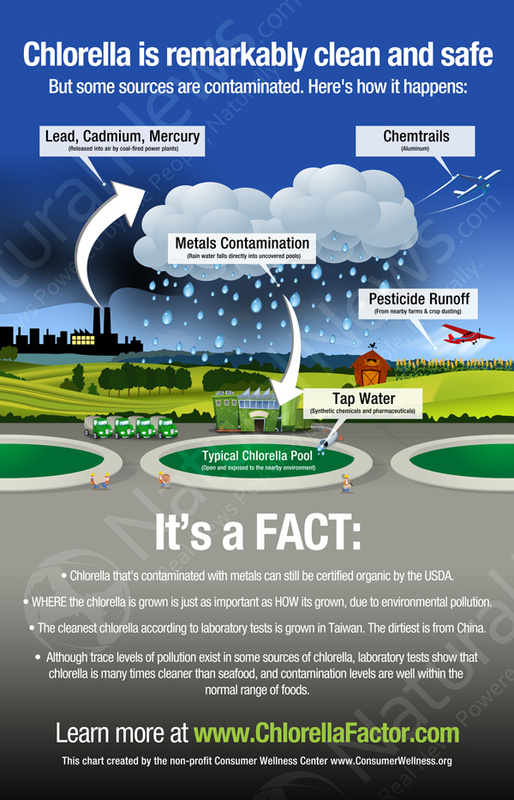 • Chlorella grown in China is the most contaminated with aluminum and other metals. • China-produced chlorella is the cheapest at the wholesale level. • "Organic" chlorella from China is more contaminated than non-organic chlorella from Korea. • Taiwan produces the cleanest outdoor (sunlight) chlorella using spring-fed water, but most chlorella purchased today that's made in Taiwan is not from this certified organic producer. • The certified organic chlorella from Taiwan is the most expensive in the world, at wholesale. • "Certified organic" does not mean free from contamination. • Japan is not the cleanest source of chlorella. Taiwan is actually cleaner, according to our lab tests. • The aluminum contamination levels of chlorella is only a fraction of the aluminum contamination levels found in everyday foods like celery, corn and beans. • Chlorella has been scientifically studied vs. radiation poisoning. • Chlorella marketing claims have no correlation to the actual quality of the chlorella being sold. • Some companies "cut" their chlorella with cheap calcium filler. This is visible on the tablets when inspected closely. • There is no commercially-grown chlorella in North America. • Chlorella in capsules can cost 380% more than chlorella in tablets. • Cell wall "cracking" to achieve "broken cell wall" or "open cell wall" status is pushed heavily in marketing text, but in truth the more important question is the digestibility of the chlorella, not how it is "cracked." • Arsenic, cadmium, lead and mercury all tested non-detectable levels. Aluminum, the "safest" of the metals, tests at just 3.8 ppm, nearly 1/10th the level of aluminum found in certified organic chlorella from China. On a personal note, I want you to know why I undertook this effort to not only test all the sources of chlorella, but also to import, package and retail only the cleanest chlorella I could find. I've been taking and advocating chlorella for many years, and I feed it to the animals on the ranch where I live: donkeys, chickens, goats and even my dog Roxy. We all eat chlorella, and the donkeys go crazy over it. I'm the original author of the now-famous website www.ChlorellaFactor.com as well. Given how much chlorella we all consume on a regular basis, I really felt a strong desire to test the sources of chlorella I was eating and find the cleanest sources possible. It was also important to me to confirm that these sources of chlorella were highly digestible so that the nutrients could be more fully absorbed. As the editor of Natural News and the decision maker on what products we carry in our store, I could have chosen any chlorella, including the cheaper (high-profit) chlorella grown in China. But for me, that just wasn't good enough. I didn't feel comfortable feeding China-grown chlorella to my animals, so how could I justify selling it to my readers? I couldn't. I can only offer to my readers the same high-quality chlorella that I eat for myself and share with the animals under my care on the ranch. I've been around long enough and have seen enough funny business in the world of nutrition to know that ethics matter. My personal code of ethics -- which has only grown stronger and more resolute over the past few years -- demands that I treat my own readers with the same nutritional consideration that I would grant to a close friend or a family member. That's why every single thing you find at the Natural News Store today is something that I personally consume or recommend to my closest friends, colleagues and family members. It's also why our shopping cart doesn't carry 1000 products. I'm very particular about what I will promote, and if it takes me an extra four months to do the lab tests and find the best sources before rolling something out, then so be it. When you purchase Clean Chlorella from the Natural News Store, you also support clean production practices in the industry. Our aim is to help drive the chlorella industry to be cleaner and more transparent in the composition of its final product. 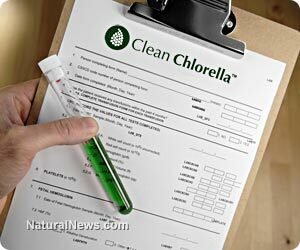 My pledge to you, Natural News readers, is that I will always seek out the cleanest, safest, most highly digestible and most pure sources of chlorella on the planet, and I will make those available to our readers even if it means less profit than retailing cheaper, lower-quality chlorella. When you purchase Clean Chlorella from the Natural News Store, you not only help financially support our investigative journalism efforts, you also help support the chlorella industry's most responsible and ethical producers of this amazing superfood. and Clean Chlorella in a 64 oz steel can for long-term nutritional preparedness. Before March 1st, we will be offering Clean Chlorella SL (certified organic) in bags and cans as well. All these products are packaged in our USDA certified organic facility in central Texas. Our chlorella ranges from 54% to 61% protein, making it an outstanding protein supplement as well as a powerful source of chlorophyll and CGF (Chlorella Growth Factor). Thank you for your support, and we hope you gained valuable knowledge from our lab testing and research efforts on this subject.